There are Only 71 In The World ! Your PADI Course Director and the people that teach professional level courses are of utmost importance to your success throughout your internship and as a foundation for your career as a professional. 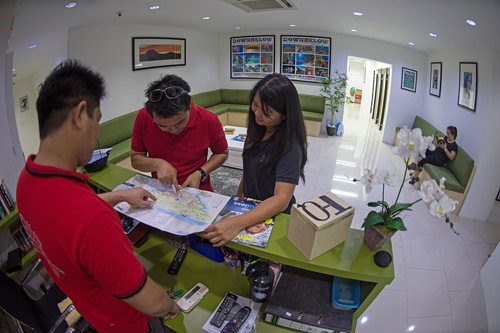 At Downbelow we have a dedicated full time team of highly trained instructor trainers to guide you and teach your professional level diving courses. We are the only PADI 5 Star IDC Centre in Sabah to boast TWO resident PADI Course Directors. British Platinum PADI Course Director, Richard Swann heads-up the team along with local Sabahan PADI Course Director Fauzi (aka Pablo). Having resident PADI Course Directors means that they are excellent mentors for the team and they do not split their time between difference dive schools. 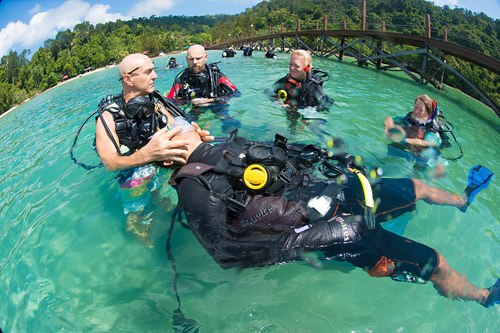 Downbelow has built a reputation for training and delivering PADI Instructors that are ready for the work place. Awarded for our contribution to Instructor Development and achieving Platinum PADI Course Director Status over consecutive years support our claim for excellence. 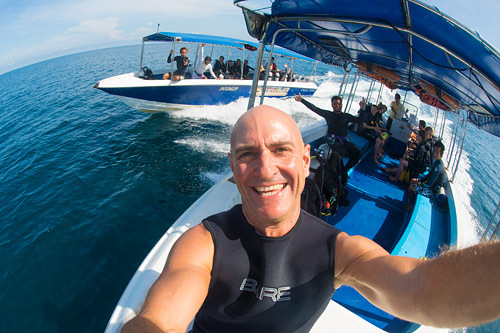 Downbelow Managing Director and PADI Platinum Course Director Richard Swann is a highly experienced Instructor Trainer, with almost two decades of professional diver training. Richard leads our Go PRO team with his considerable knowledge and oversees the conduct of all the diver training in our professional courses. A PADI Course Director is the highest level of professional rating in the PADI system of education and to be awarded the Platinum level is indication of our commitment to instructor development. There are currently only 71 Platinum PADI Course Directors worldwide. Pablo is a highly respected PADI Course Director and underwater photographer. He decided to pursue his diving dream under the tutelage and mentorship of PADI Platinum Course Director Richard Swann, and enrolled in our company-sponsored Go PRO internship program to qualify as a Divemaster in 1 year. He showed a lot of promise with his enthusiastic attitude and inquisitive nature, so Downbelow offered a further sponsorship to enroll in the February 2013 IDC for the next level: PADI Open Water Scuba Instructor (OWSI). During the following years Pablo excelled in professional level diver training and we decided that our ever growing PADI 5 Star IDC Centres required a second PADI Course Director and we supported Pablo in his application and training to become a PADI Course Director. He is now an integral part of our management and development team. Downbelow Director and PADI Master Instructor Joanne has been a dive educator since 2001, and teaching Instructor-level courses for more than a decade. Joanne leads the Head Office team with her extensive knowledge on the ‘business of diving’. Joanne possesses the ability to recognize the strengths and weaknesses of an individual’s career in the scuba diving industry. With the consideration of our candidates professional needs, Joanne & her team will tailor your internship program with the best possible mix of training and experience so by the end of your internship you are a confident PADI professional ready to work. At the same time Joanne will ensure you are receiving great value for money since at this stage of your PADI career every penny counts! 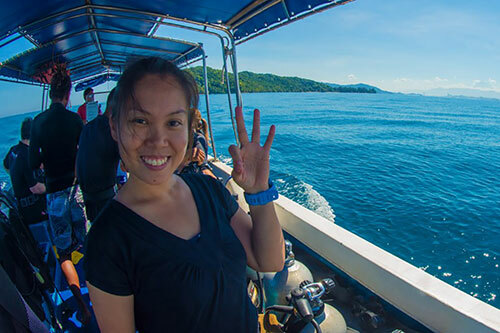 With several years of experience in Sabah’s tourism industry, Melissa is one of our experts in tailoring unforgettable holiday packages and she specialises in designing suitable itineraries for professional scuba diving internships. Based at our Downbelow Travel Centre in our Kota Kinabalu HQ, Melissa will be the candidates’ first friendly correspondence with Downbelow Marine and Wildlife Adventures. Go PRO manager & advisor Melissa keeps in close contact with Go PRO interns to ensure our excellent customer service is maintained. She is a passionate PADI Rescue Diver and have been scuba diving since 2010. Equipped with her passion, she’s a dedicated counsellor, and assists interns beyond the scope of their professional dive training, such as arranging accommodation of any budget, flights, visa requirements, and almost anything and everything else! Chrizz started his Go Pro journey at Downbelow PADI 5 Star Career Development Centre as our Work For A Career trainee way back in 2014. For a year, Chrizz worked hard and trained his way up until he finally became a PADI Divemaster. Not long after that, Chrizz realises that there are more opportunities as a PADI Dive Instructor and we could see his passion, so he then joined the PADI Instructor Development Course! 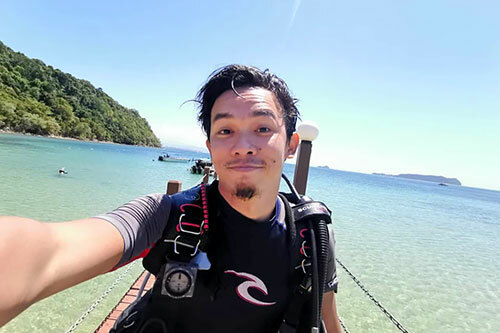 When teaching, Chrizz finds it is very rewarding when his students have certified as PADI Divers and he gets to show them the wonders of the beautiful underwater world. Making sure the students have fun but always prioritising safety at all times, Chrizz guides his students to overcome their fear and anxiety throughout their course and aims to change their perceptions about diving. Lulu began as an enthusiastic and skilful Travel Consultant at our Downbelow Travel Centre who has love for nature, wildlife and the ocean. After years of showing interest in scuba and building her dive experience by diving during her off days almost every time, it didn’t come as a surprise that Lulu developed a goal to become a PADI Pro just like her instructors who taught her in her courses. After receiving her PADI Rescue Diver qualification, Lulu decided to take up the challenge and applied for the PADI Divemaster Internship at our very own Downbelow PADI 5 Star Career Development Centre. PADI Platinum Course Director Richard Swann suggested that Lulu goes for the PADI Divemaster and PADI Instructor Development Course combo and she never looked back! We are proud of Lulu as she is one of the few local female PADI Dive Instructors in Sabah, Malaysia Borneo! All the way back in 2015, Oliver was one of our awesome Work For A Career candidate here at Downbelow PADI 5 Star Career Development Centre. Turning from zero to hero, Oliver trained for a year and as a reward, become a PADI Pro when he completed his PADI Divemaster Course. Then for the next two years, Oliver continued to develop his skills and knowledge to take the Go Pro challenge by taking the next step in the PADI Instructor Development Course. 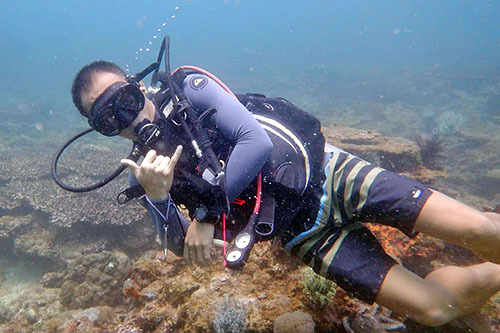 Now a PADI IDC Staff Instructor, Oliver is doing what he loves and maintains to be hardworking, focused and coolheaded when conducting courses. Positive feedback is important, and Oliver encourages his students to build up their confidence. He will share the valuable experiences he has gained with his students whenever he has the opportunity and always enjoy meeting new people. One of the most memorable moment in his career was being part of preparing and sinking of KM Kuraman, a wreck dive site in Tunku Abdul Rahman Marine Park! 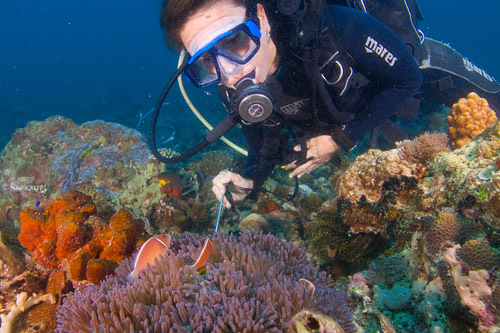 Begin your Professional Scuba Diving Internship ! 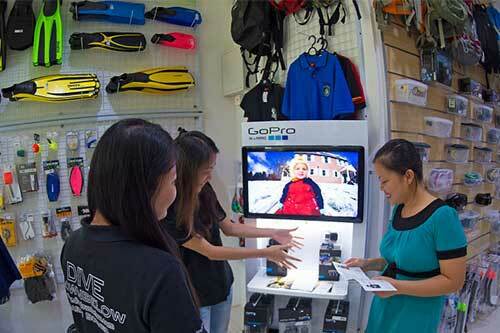 We have the largest range of dive and adventure equipment in Sabah. Selling dive equipment, apparel, gadgets, hiking gear and various diving and adventure accessories.